3D Digital Image Correlation (DIC) is an optical Computer Aided Engineering (CAE) method that makes use of stereoscopic technology to measure contour, deformation, vibration and strain of a target surface over time. The surface is tracked by using a random surface pattern (commonly referred to as speckling). The technique can be used for many tests including tensile, torsion, bending and combined loading for both static and dynamics applications. When the displacement/distortion occurs over a very short period of time, for example during fast impacts, explosive events, high speed cameras need to be used. Regards the specific camera requirements, they have to be synchronised to the exact frame and maintain a high resolution at high frame rates, whilst producing a good contrast of the speckling effect. A pair of matched lenses are also required. Mono cameras are preferred although good results can be obtained from colour sensors. 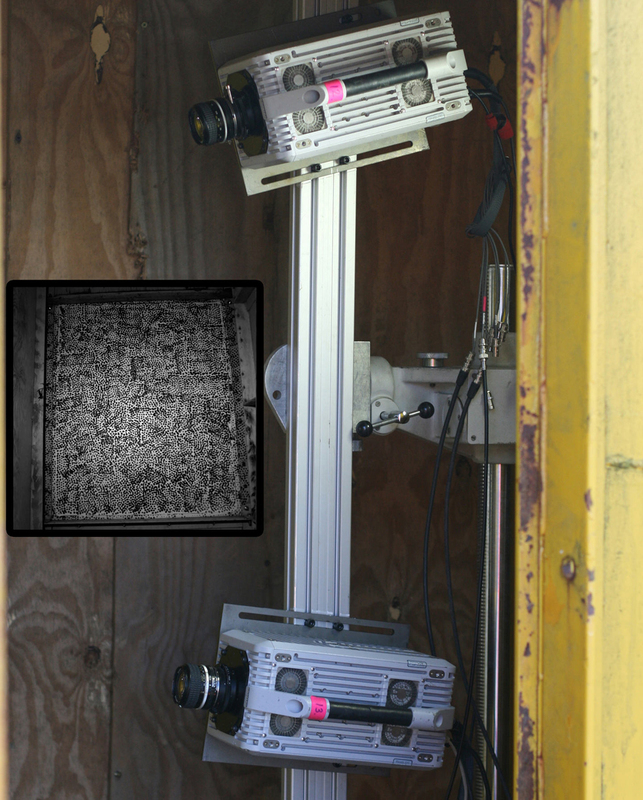 Slowmo Ltd has provided high speed cameras for several DIC experiments involving blast trials. 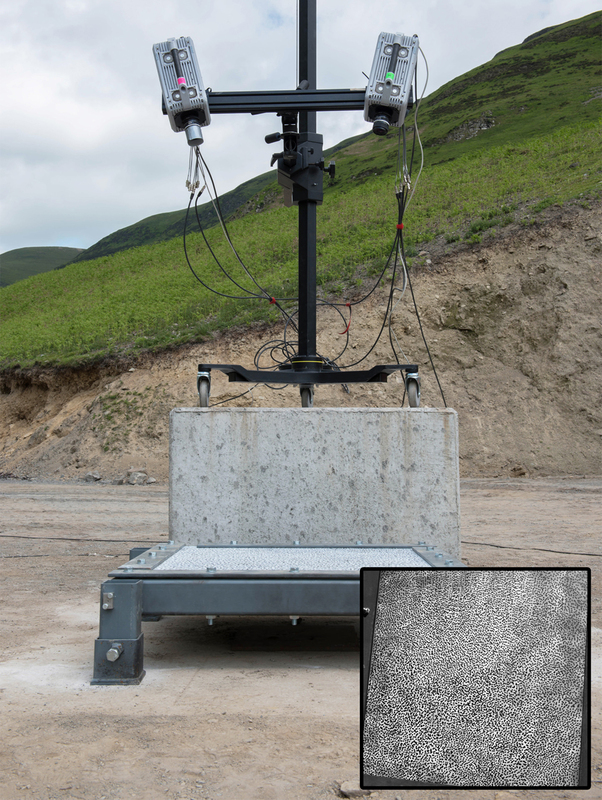 Slowmo teamed up with Simpact, GOM and Radnor Ranges to prove the feasibility of DIC analysis for explosive blast load testing on armoured steel plate. A pair of synchronised Photron SAX2 32Gb mono high speed cameras were used, recording at 16000fps at 896 x 896 resolution. After an initial test trial, the cameras were successfully modified in order to withstand the shockwave generated by the charge. A series of 4 blasts were then recorded. Approximately 80 frames were captured from detonation to maximum distortion of the plate. A full summary of the experiment and results can be seen here. Photron SAX2 mono high speed cameras in position on 3D camera mount (supplied by GOM). Inset – view of speckled plate. Blast testing of composite sandwich panels for marine applications. Slowmo Ltd provided 4 pairs of high speed cameras for Imperial College London for a DIC trial testing composite sandwich panels. The panels were 1.7 m x 1.5 m in size with a 25 mm thick core. The panels were subjected to a 100 kg TNT equivalent at 15 m stand-off distance. Each pair of cameras were mounted on a 3D rig inside a shipping container. Frame rates ranged from 4000fps to 12000fps. All 8 cameras were triggered simultaneously and successfully captured images of the distortion from all 4 panels. 3D digital image correlation (DIC) was performed on the images to calculate the rear face-sheet displacement and strain. Photron SAX2 high speed cameras in position on 3D DIC rig. Inset – view of speckled panel. Underwater blast testing of composite panels for marine applications. Slowmo Ltd provided camera support for a unique DIC trial led by Swansea University/Imperial College London. Normally, composite panels are tested against shock waves through air. This time the front of the panel was submerged in a body of water. A 1 Kg explosive charge was placed in the water at approximately 1 m away from the panel. To our knowledge this is the first time such a trial has been performed. The location was the Test and Evaluation facility at Radnor Ranges. Slowmo set up 2 x synchronised Photron SAX2 mono high speed cameras mounted high on a 3D rig. The charge was detonated and the back deformation of the panels was successfully captured at 12500fps at 1024 x 1024 resolution. Aside from blast applications, Slowmo can provide suitable high speed cameras for industrial DIC applications many of which are automotive based. We can provide a pair of cameras from any of our Photron range – SAX2, AX-100, SA1.1 and SA3. For a full comprehensive DIC provision – from high speed image data collection to detailed CAE/FEA reports, contact Simpact Engineering Ltd.